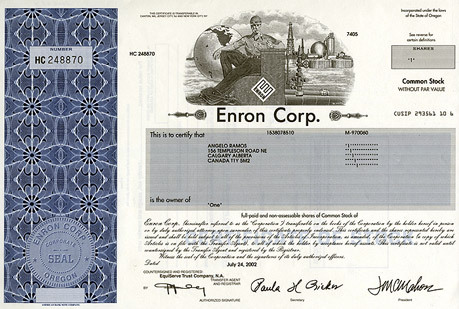 An Enron stock certificate. I believe these are legal tender in Hell. Next year, there will be questions coming from the classroom about the economy. Make sure you have the right tools for the job. This month’s edition of History Now from the Gilder-Lehrman Institute of American History focuses on the American economy, and is packed with information about our economic development, focusing on entrepreneurs, the development of banking, the stock market, and the evolution of American fiscal and monetary policy. On the sidebar is some interesting information for teachers, including lesson plans and interactive units for students. Definitely check out the slideshow on financial scandals, which cover everything from the Duer-Pintard debt market scandal of 1792 to the Enron mess of 2002. Speaking of Gilder-Lehrman, that reminds me: I’ll be sending out one more post before I head out for my Gilder-Lehrman summer seminar at UCLA next week. Depending on the workload, I may or may not post when I’m in California. I’ll know when I get there.